Rutile is the mineral name for natural crystals of titanium dioxide. 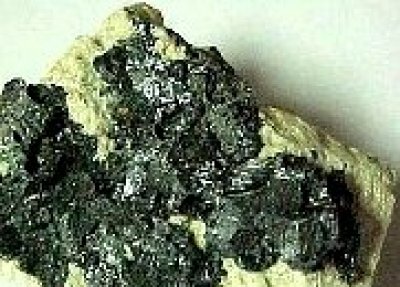 However in nature rutile is always contaminated by up to 15% other minerals (especially iron but also things like tantalum, niobium, chromium and tin, the analysis provided here is obviously a simplification of the real picture). The term 'rutile' is thus generally understood to refer to the brown powder into which these minerals are ground and industry accepts up to 15% contaminants and yet still calls it rutile (below 85% titanium is called ilmenite). Rutile is considered an impure form of titanium whereas ilmenite is considered as FeTiO3. Grades of rutile are sometimes named after one of the impurities (e.g. 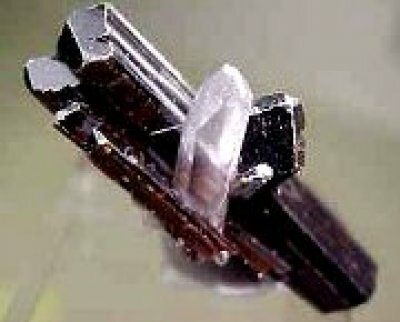 Niobian Rutile). Rutile is used in many industries (e.g. welding rods, paint) and ceramic uses are minor in comparison (for this reason bags of rutile might have labels like "Welding Rod Titanate"). Rutile is often sourced by companies in the titania and zircon supply business. The are large reserves of rutile in the world and any supply shortages are thus related to other factors. Rutile is available in light tan calcined ceramic grade powder, darker uncalcined powder, and granular form. Either grade of powder is normally ground very fine (e.g. 325 mesh). In glazes it is generally thought to be better to use the ceramic grade (calcined) since the decomposition of raw rutile during firing could be a source of glaze imperfections like pinholing and bubbles. However in our experience the LOI (weight loss on firing) when calcining rutile is very low (less than 1%). Rutile produces many crystalline, speckling, streaking, and mottling effects in glazes during cooling in the kiln and has been used in all types of colored glazes to enhance the surface character. It is thus highly prized by potters, many attractive variegated glazes are made using it. Many potters would say that their living depends on their rutile supply! This material can be inconsistent in the amount of iron and impurities producing variations in color and surface character, thus manufacturers will blend ores from different deposits (Ferro in the US blends various Australian materials in addition to material from Florida). For example, one major American supplier, TAM (now Ferro), relied on a high quality Sierra Leonian rutile deposit until 1995 when political problems in the country cut the supply. Since then no other substitute has provided the same quality. 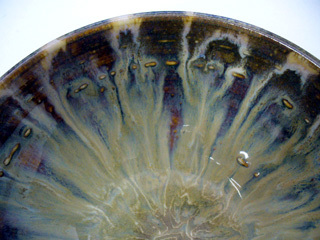 Considering that it is the metallic coloring impurities in rutile that are the subject of its variation and that the function of rutile in glazes is most often partly or mainly as a colorant, it is easy to see that visual consistency variations can be expected when using this material in ceramic glazes. Large users of rutile will often track batch numbers from the manufacturer and test when the number changes. If serious differences are detected another batch may be requested. Failing this the situation can sometimes be dealt with by adjusting the amount of rutile in the recipe or firing differently. In more serious situations adjusting the recipe and employing other materials like iron and titanium might be needed. In any case, it is important to understand the base glaze and the mechanisms by which rutile imparts the desired visual effect. Buying large amounts of a batch that works well is thus a good idea with a material like rutile. 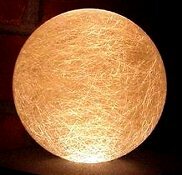 Rutile is very refractory in oxidation, even a mix of 50% borax alumina-free frit like Ferro 3134 will not melt rutile in a crucible. In reduction, the improvement in melting will depend on the amount of iron present. In ceramic glazes rutile is more often considered a variegator than a colorant. 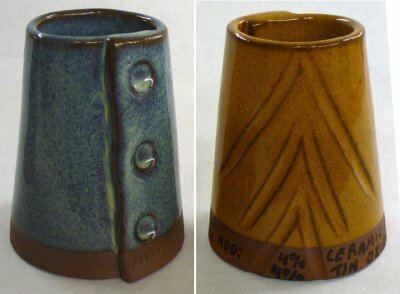 As little as 2% can impart significant effects in stoneware glazes. It is normally used in combination with a wide range of metal oxide and stain colorants to produce surfaces that are much more visually interesting. 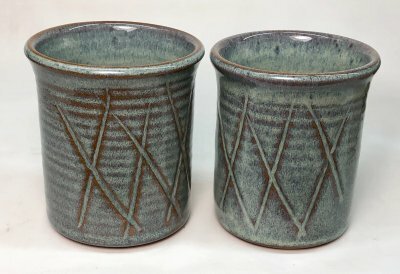 In glazes with high melt fluidity (e.g. having high boron), large amounts of rutile (e.g. 6-8%) can be quite stunning. The rutile encourages the development of micro-crystals (it is crystalline itself) and rivulets. Since rutile contains significant iron its use in combination with other colorants will often muddy the color that they would otherwise have or alter it if they are sensitive to the presence of iron. Even though rutile generally makes up less than 5% of stoneware glazes that employ it, they are often called 'rutile glazes' in recognition of its dramatic contribution. 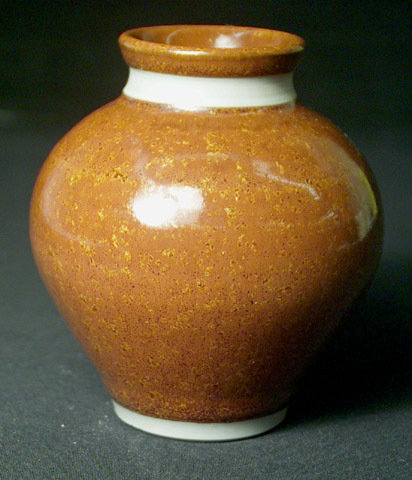 Excessive rutile in a glaze can produce surface imperfections. In addition, when rutile is employed in higher percentages (e.g. 5%+) a given percentage might work well whereas a slightly higher amount can look drastically different. Such situations are vulnerable to chemistry changes in the supply of rutile. Thus people will often do a line blend trying a range of percentages to determine an optimal amount. In glazes rutile can be quite sensitive to the presence of opacifiers. While an unopacified glaze glaze might appear quite stunning, the addition of a zircon opacifier will usually drastically alter its appearance and interest because the variegation imparted is dependent on the glaze having depth and transparency or translucency. Strangely rutile and tin, another opacifier, can produce some very interesting reactions and it is quite common to see tin in amounts of up to 4% in rutile glazes. 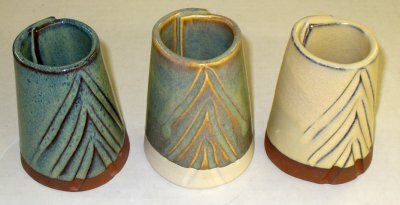 In these cases the tin appears to react in the crystal formation rather than opacify the glaze. Rutile powder, although its color makes it appear to be a very crude ground mineral, normally contains 90%+ titanium dioxide. However this does not mean that you can use a 90% titanium:10% iron mix and get the same result in a ceramic glaze (obviously line blending would be needed to match the amount of iron). The mineralogy and significant other impurities in rutile are a major factor in the way it acts in glazes and are not easily duplicated using a blend of other things. Sometimes the special effects that rutile produces in glazes are also partly a product of a coarser grade (larger particle size). These likewise cannot be easily duplicated by more refined materials. Unfortunately the trend at some mining operations (at least in Australia) is to fine grind the rutile on-site, making it more difficult for ceramic operations to obtain the coarser grades. Although rutile will normally stain a glaze brown or yellow, its crystallization effects can significantly lighten the color of iron glazes. 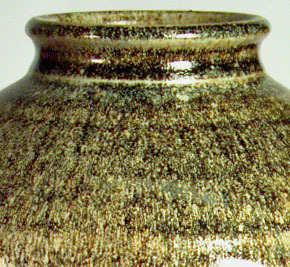 Higher amounts of rutile in stoneware glazes will often contribute glaze imperfections. 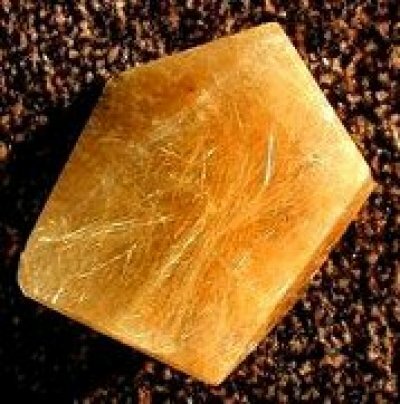 Granular rutile is sometimes used in bodies and glazes to impart fired speckle. Rutile is used for special effects in leaded glazes and can form up to 15% of the recipe. 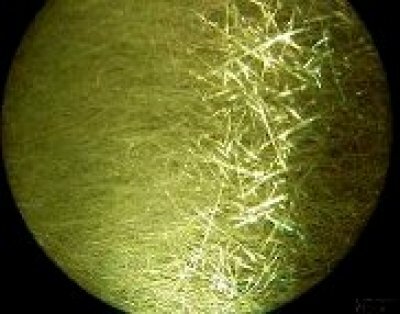 Rutile can be used as a tone modifier to soften the more potent colorants. Rutile sand (granular) can be used to add speck to bodies. 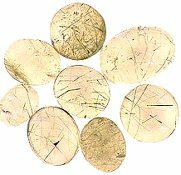 Rutile can be added to low fire bodies to make them burn golden yellow. Rutile and cobalt can crystallize to form green glazes. Rutile can produce soft tan colors due to its iron content, especially in matte glazes. In zinc glazes powdered rutile develops an orange-tan color. 5-8% added rutile can give powder to deep blue colors in reduction. These colors can be brilliant and mottled with shades of browns and tans. Rutile effects can be hard to Like copper reds, rutile blue reduction effects depend on adequate silica being available (7 times or more that of alumina). Classic rutile blue glazes are best made by using rutile in fluid glossy bases. The amount of iron in the rutile (or from the body) determines the degree of blue since its reduction to FeO is a key to the effect. Since rutile is variable in makeup, changes in the iron content will change the blue color. The fact that titanium dioxide additions do not make good blues suggests that the iron-titanium mix is the key to good color. 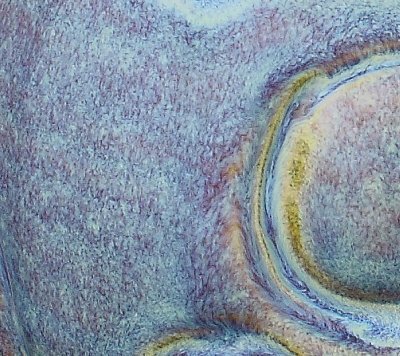 Silky matte variegated blue glazes can also be made with rutile additions. 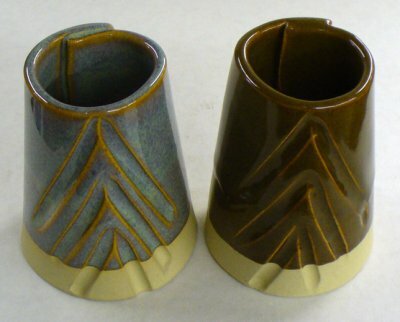 If you employ this type of glaze be sure that you have a large supply of rutile on hand and test new supplies throughly. 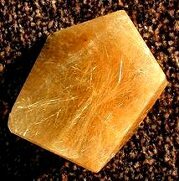 Rutile produces many shades from pale straw to tan to cinammon brown to orange brown. Alkaline glazes experience less of the classic rutile crystalline effect. Color intensifies with increased amounts and tends to be darker in reduction. Even in small amounts, rutile tends to matte the surface of leaded glazes. 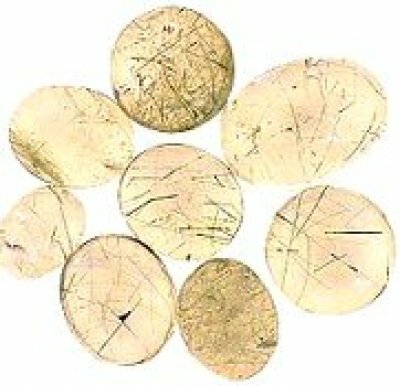 As an opacifier rutile is economical compared with pure titanium and it is employed where white shades are not required. It is also used to stain pottery bodies and glazes (yellowish, orange and tan colors are most common because of its iron content). Rutile has the unique property of breaking up and variegating the color and texture of glazes, it is quite popular in tile and art pottery for this reason. However this effect depends on the rutile powder being coarse enough to act as an adjunct (the finer grades disperse more readily into the glass matrix). 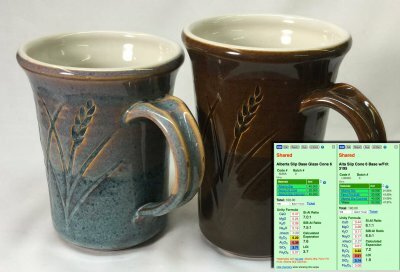 The addition of 4-8% rutile to many stoneware glazes can make an otherwise drab or flat glaze become much more interesting. When used in combination with colorants, it can be very effective at improving the character, however it will affect the color. When used with added tin streaking and mottling effects can be enhanced, especially in lead glazes. This is what about 10% iron and some titanium and rutile can do in a transparent base glaze with slow cooling at cone 10R on a refined porcelain. 2, 3, 4, 5% rutile added to an 80:20 mix of Alberta Slip:Frit 3134 at cone 6. This variegating mechanism of rutile is well-known among potters. 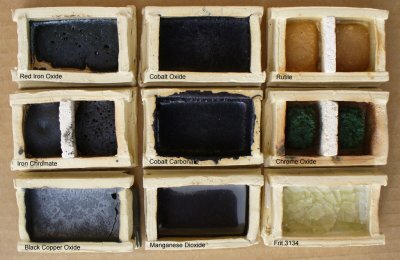 Rutile can be added to many glazes to variegate existing color and opacification. If more rutile is added the surface turns an ugly yellow in a mass of titanium crystals. Tin oxide can stop the rutile variegation effect dead in its tracks! This is Alberta Slip (GA6C) on the left. Added frit is melting the Alberta Slip clay to it flows well at cone 6 and added rutile is creating the blue variegated effect (in the absence of expensive cobalt). 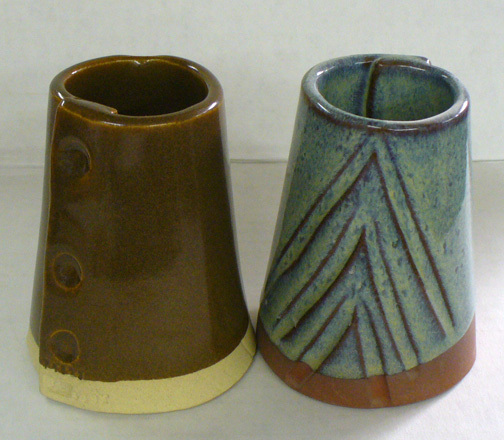 However GA6D (right) is the same glaze with added Tin Oxide. The tin completely immobilizes the rutile blue effect, it brings out the color of the iron (from the rutile and the body). 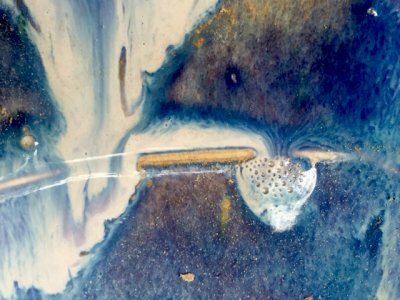 A closeup of a cone 10R rutile blue (it is highlighted in the video: A Broken Glaze Meets Insight-Live and a Magic Material). Beautiful glazes like this, especially rutile blues, often have serious issues (like blistering, crazing), but they can be fixed. The referred to surface is the outside of this large bowl. 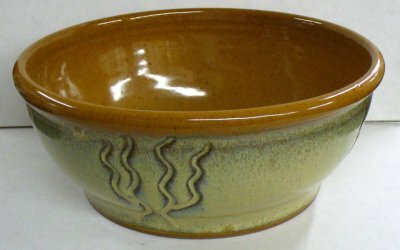 The base glaze (inside and out) is GA6-D Alberta Slip glaze fired at cone 6 on a buff stoneware. The thinness of the rutile needs to be controlled carefully, the only practical method to apply it is by spraying. The dramatical effect is a real testament to the variegating power of TiO2. 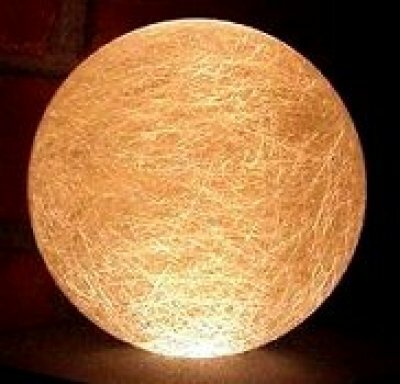 An advantage of this technique is the source: Titanium dioxide instead of sourcing TiO2 from the often troublesome rutile. A mineral form on titanium dioxide. A mineral form of titanium dioxide.